Effect of atomic substitution on the structural and magnetocaloric parameters of Ni51Mn34In15 alloy has been investigated using powder X-ray diffraction and magnetization measurements. 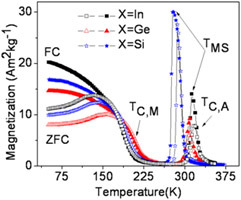 A small amount (1 at.%) of Silicon and Germanium substitution for Indium in Ni51Mn34In15 alloy was done to perturb the inter atomic distances as well as electronic concentration of the alloy. This atomic substitution shifts the transition temperatures and hence the temperature at which the peak magnetic entropy change occurs in this alloy system. X-ray diffraction studies confirmed the existence of the martensitic phase in Ni51Mn34In15 and Ni51Mn34In14Ge1 alloys, and austenitic phase in Ni51Mn34In14Si1 alloy at room temperature. The highest magnetic entropy change ΔSM = 19.9 Jkg-1K-1 and refrigerant capacity RC = 35.9 Jkg-1 values are exhibited by the Ni51Mn34In14Si1 alloy at 279 K for a magnetic field change ΔH of 0 – 1.2 T.